Flag Day is June 14th. This day commemorates the passing of the resolution of the adoption of the flag of the United States in 1777 by the Second Continental Congress. But how did we get our flag? Who made it? When did it first fly? These questions are shrouded in mystery, myth, and legend. The first known use of thirteen stripes on an American flag is found upon the flag of the Philadelphia troop of Light Horse in 1775. Abraham Markoe, a Danish man, and the first captain of the Light Horse, is known to be the designer of the flag. An earlier striped flag was used by the Sons of Liberty, a non-military group. In 1767, that group used a flag with nine vertical stripes (five red and four white). It is probable that the nine stripes represented the nine Colonies that were in attendance at the Stamp Act Congress of 1765 in New York. 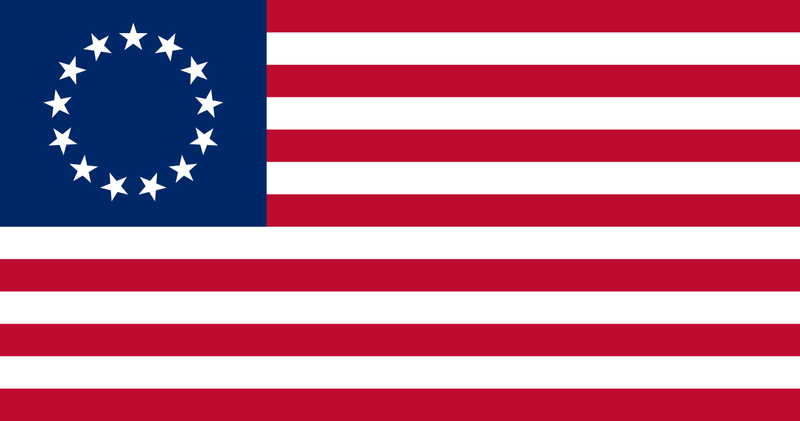 By 1776, this flag had 13 stripes, alternating red and white, and turned to the horizontal. As the new United States and Great Britain continued the war, the Union Jack of the Continental Colors needed to be replaced on the flag of the new nation. There exists no proof of who designed the field and stars of our flag. The resolution of Congress merely mentioned that the flag have 13 white stars on a blue field; the position and shapes of these stars was left to the imagination. In the most propagated myth on the creation of the flag, Betsy Ross was the maker of the first flag. The story even goes as far as to say she created the design of the flag, and her name is still affixed to that flag design today. Rachel Fletcher, daughter of Betsy Ross, Sophia B. Hildebrant, granddaughter of Betsy Ross and Margaret Donaldson Boggs, niece of Betsy Ross all supplied affidavits stating similar stories that Elizabeth Claypoole (Betsy Ross) had told them before her death. There is little more evidence to support this claim. Strong evidence does exist, however, that Francis Hopkinson, a signer of the Declaration of Independence from New Jersey, was responsible for the design the first Stars and Stripes. At the time that the flag resolution was adopted, Hopkinson was the Chairman of the Continental Navy Board’s Middle Department. He also helped design the Great Seal of the United States for the government, along with designs for other seals and symbols. Hopkinson later submitted a letter to the Continental Admiralty Board asking “whether a Quarter Cask of the public Wine will not be a proper & reasonable Reward for these Labours of Fancy and a suitable Encouragement to future Exertions of a like Nature.” His request was turned down since the Congress regarded him as a public servant. Furthermore, after resigning from the Naval Board in August 1778, Hopkinson wrote a letter to the Board of Admiralty regarding his design for that board’s seal as well as the design of “The flag of the United States of America” and other seals and currency designs. The inclusion of the flag, listed as “the great naval flag of the United States” on his account for payment (he asked for $2,700 compensation), was disputed by no one at the time, as far as the historical record can tell. The record, therefore, points to Francis Hopkinson as the designer, and leaves Betsy Ross as the American myth. Regardless of who designed it, the new flag definitely flew at the Battle of Brandywine in Pennsylvania on September 11, 1777, and at all battles thereafter. And though the design has changed slightly over the years, the stars and stripes remain on the flag, which still flies in battle to this day. Tappan, Eva March. The little book of the flag. Boston: Houghton Mifflin Co., 1917, p 34. Paper read before the Historical Society of Pennsylvania (March 1870), entitled The History of the Flag of the United States by William J. Canby. All images from Wikipedia, unless otherwise noted.